Your brain is the main control centre of your body, in fact it is in charge of your entire body. Learn more facts about human brain for kids with this lesson. Your brain needs lots of energy to do all these. Therefore, it needs a good supply of oxygen. This helps you to think, have ideas, feel emotions, change moods, express desires, solve problems, and store and recall memories. These are known as higher mental processes. Also, part of your automatic brain is involved in involuntary actions, such as controlling heartbeat, breathing, digestion etc., without your knowledge. These are known as lower-level processes. Your autonomic nervous system (ANS) deals with these body processes. 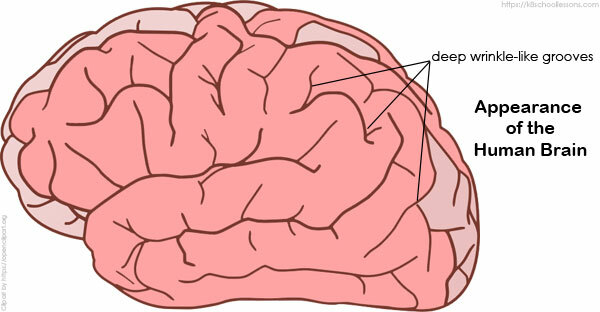 The human brain is an organ made of dense, greyish-pink tissue. It feels like stiff jelly and is covered with deep wrinkle-like grooves. The brain is composed of neurons, blood vessels and some supporting cells called glia. The brain has got its greyish colour from the neurons and pink colour from the blood vessels. An average adult human brain weighs about 1400 g and contains billions of neurons and trillions of glial cells. These help you to think, feel, remember, dream, control your body and live. Make fists with both of your hands and put them together. Now you can get a rough idea of how big your brain is. There can be about as many cells in your brain as there are stars in the galaxy or the Milky Way! Now this lesson, Human Brain for Kids, will show you how your brain is protected. Your brain has got an amazing protection as it is the most vital part in your body. How is the brain protected? The brain is located inside the head. 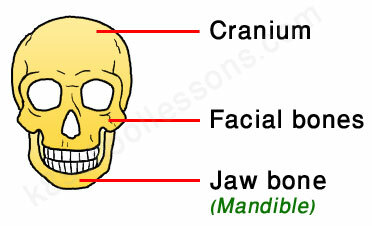 It is protected by the bones of the skull and a covering of three thin membranes called meninges. For extra protection the brain is surrounded and cushioned by liquid that helps to absorb shocks. Let’s now learn the structure of the brain and its parts with this lesson, Human Brain for Kids. The brain has its main parts. At this stage we are going to learn the following major parts of the brain. The cerebrum is the large, wrinkled lump that curves over, and covers most of the other parts of the brain. It makes up about 85 percent of the weight of the brain. 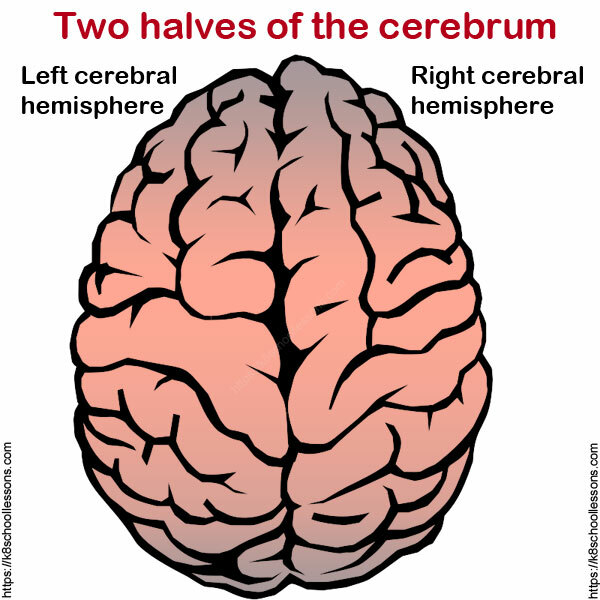 The surface of the cerebrum is folded, so that it has a large surface area. We call this area cerebral cortex. The cerebrum is the ‘thinking part’ of the brain. 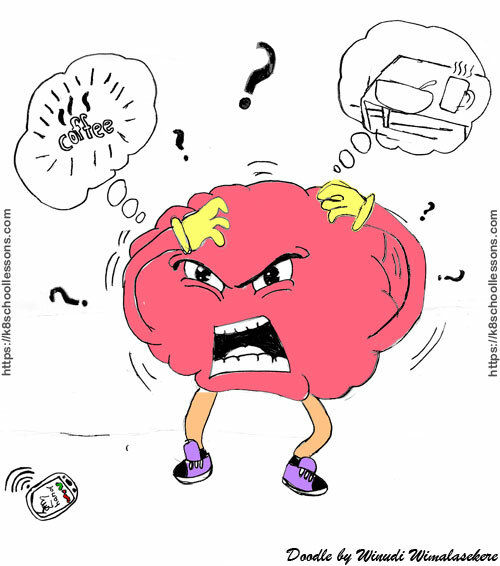 Different areas of the cerebrum are in charge of different activities. The cerebral hemispheres look similar. The halves are connected by bundles of nerve fibres. Each hemisphere is divided into four lobes, or regions. 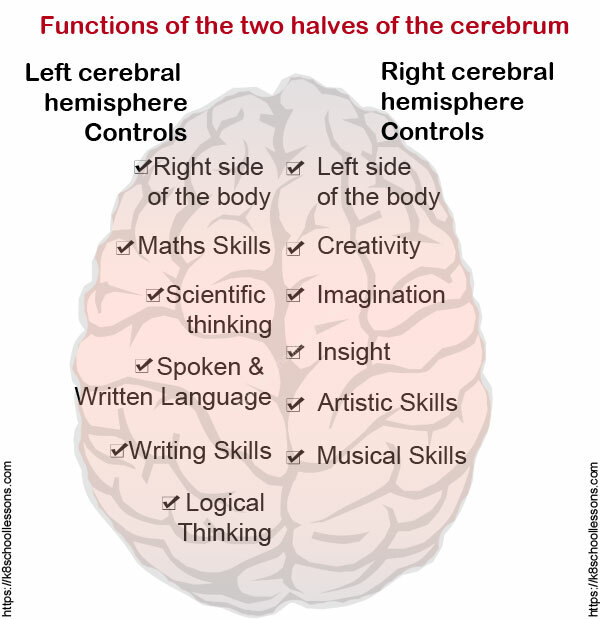 Both hemispheres are the control centres for different skills and abilities. Now be ready to learn a great deal of functions done by these hemisph with this lesson, Human Brain for Kids. Hand movements and the control of speech of a right-handed person come from the left cerebral hemisphere. Hand movements and the control of speech of a left-handed person come from the right cerebral hemisphere. The left side of the brain picks out details, while the right side sees and understands the whole idea. Both sides work together and help each other. This is the outer layer of the cerebrum. This is a large and thick surface area folded into bulges and grooves. 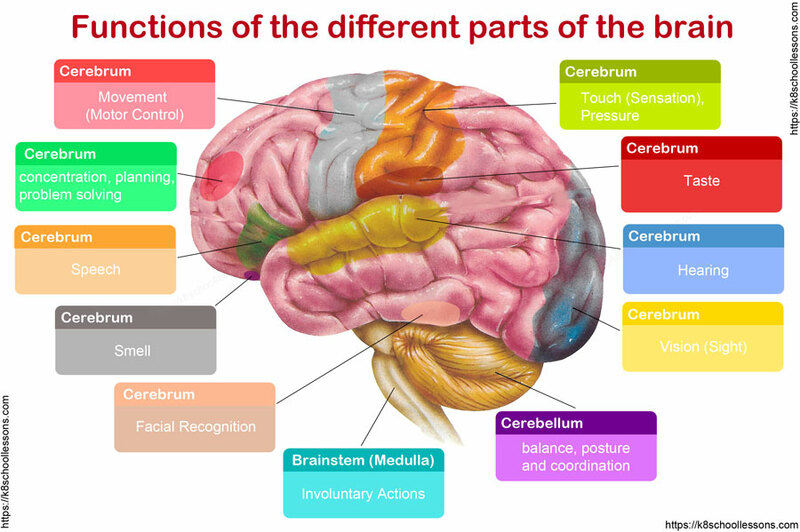 The cerebral cortex consists of different areas that deal with different parts of the body and various parts of our thinking or mental processes. What are the different tasks handled by the different areas of the cortex? What are the higher functions unique to human brain? see patterns and connections in the surroundings and many more like these. The other important part of the brain is the cerebellum. 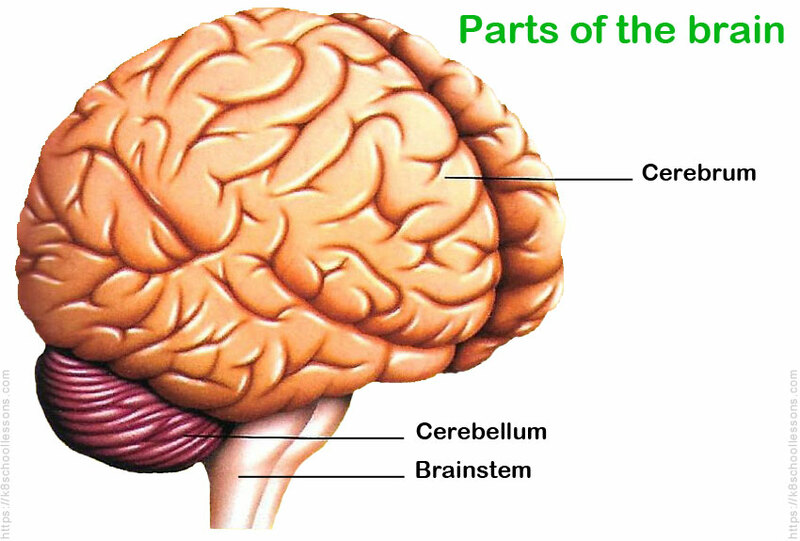 The cerebellum lies at the rear lowermost part of the brain, at the back of the brainstem. We can stand up straight, walk, lean, bend, and jog with almost no conscious thought, because of the cerebellum. How does the cerebellum coordinate posture, balance and movement? The control centres of the middle and base of the cerebellum control these actions by responding to information coming into the brian from the ears (along with the balance sensors), the eyes and the stretch sensors in muscles and joints. These messages tell the brain about the position and movements of various body parts like head, neck and trunk. The cerebellum sorts through the messages and sends out instructions to muscles, again mainly in the head, neck and trunk. The muscles work in a precise way to keep the body moving smoothly in a well-balanced manner, so we do not stumble or fall. The cerebellum also checks movements as they happen, and fine-tunes them with small adjustments. If a drastic problem takes place, the cerebellum sends signals back to the cortex, in order to make us think to deal with the problem. This is the stalk for the whole brain, which connects the cerebrum to the spinal cord. Medulla is one of the main parts of the brainstem. Medulla controls most of your body’s involuntary actions. All these are vital body processes. If the brainstem becomes inactive due to any damage, there is less or no hope for recovery. This is called ‘brainstem inactivity’ or ‘brain death’. Learn how your brain deals with memory and emotions with this lesson, Human Brain for Kids. How do you learn and remember things? You create connections between cells in your brain when you learn to do something. Next time you do it, the connections are already there, so that it is easier to carry out what you are doing. This is what we call memory and how we remember things. The amazing ability that your brain has got to store information and then use it when needed is called memory. Your memory plays a very important part in learning and intelligence. No matter how simple or complex the task is, you need your memory to carry it out. Your short-term memory only holds information for about a minute. You use it to compare prices when you go shopping, or to remember a name when you meet someone new. How good are you at remembering your name, your parents’, siblings’, friends’ and teachers’ names? You know all these names by heart. Also, you remember your parents’ phone numbers and some important phone numbers very well. Then what about a skill such as riding a bike??? You do not have to learn to ride a bike everyday like you do not have to learn to walk everyday. Some names, phone numbers and many skills can be kept for many years in your long-term memory. Like your memory, your brain controls your emotions too. This is why memories of things that happened a long time ago can still make you emotional. These are kinds of emotions that we feel every day. While we all feel these emotions in our minds, our bodies show them too. We like to live in groups. We enjoy our loved ones company. We laugh together. We joke together. We enjoy sharing our experiences with each other. This helps us to feel closer to each other. Sharing bad experiences with others makes us feel better when we are sad. Fear is a useful emotion. It helps the body stay away from things that could harm it. Phobias are fears of things, such as spiders, cockroaches that you do not really need to be afraid of. Learn how your brain handles sleep, dreaming and sleepwalking with this lesson, Human Brain for Kids. Your brain is still very busy, although you feel that it switches off when you sleep. We need to have a good sleep after a busy day. Adequate sleep relaxes you and makes you feel better, giving you a healthy lifestyle. While you sleep, electrical activity in the brain, known as brain waves, changes. It seems that the brain uses that time to sort out information it received while you were awake. Do we grow while we sleep? Yes, you do grow while you sleep. 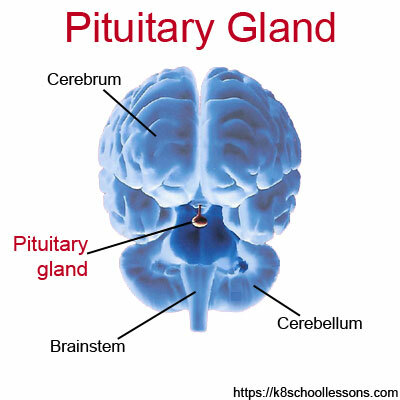 There is a small gland at the base of the brain, called the pituitary gland. It releases lots of a chemical signal, called a growth hormone while you sleep. This hormone makes you grow. So it is very important to get a good night’s rest. The amount of sleep that one should need varies according to the different age groups. Newborn babies sleep on and off all day, for 16 hours or more. After gradually getting into a routine, and once children are at school they just sleep through the night. Adults need much less sleep than children. Look at the chart below. Some like to nap during the day too, whereas some prefer only to sleep at night. A short nap can help to restore energy levels and make you feel refreshed. Do you dream while you sleep? Then you may want to know how you dream during sleep. Your brain goes in and out of a type of sleep during sleep. We call this Rapid Eye Movement or REM. At this stage, although your body stops moving, your eyes flicker and flit about. During REM sleep we do most of our dreaming. Sometimes people get up and move around in sleep at night. The person may simply sit up and look around, or do more complex things such as get dressed or even eat food. This is called sleepwalking. No one knows why sleepwalking happens. Sleepwalking is quite common, especially in young children. Hope you’ve enjoyed learning the facts about the brain with our lesson, Human Brain for Kids.